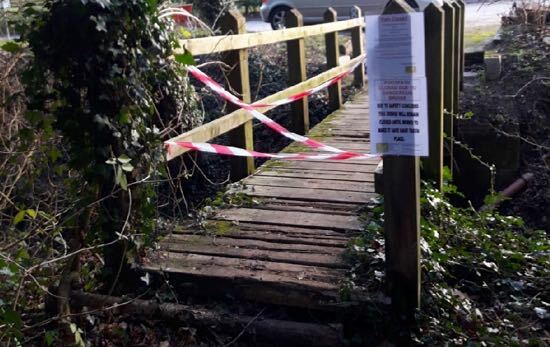 Hertfordshire County Council has closed a rotten and dangerous wooden footbridge on a local public footpath which means that walkers are unable to complete a number of popular routes. The bridge is at the east end of Essendon footpath 2 at its junction with bridleway 26. According to the council's rights of way team the bridge is rotten and "too dangerous to use". It's been closed until the local authority is able to replace it. The bridge features on two walks on our local walks site, Hertfordshire Walker. They are Walk 20: The Essendon Loop, and Walk 53: The Essendon East Loop. 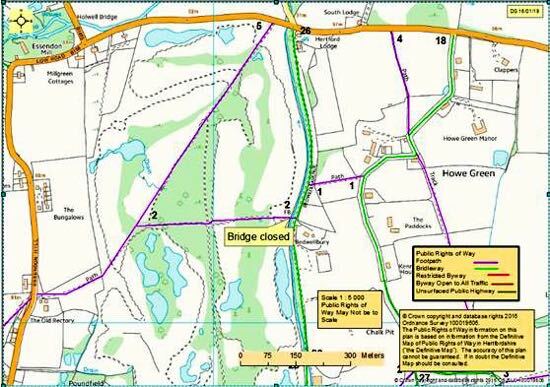 The bridge can be avoided by heading north-east on footpath 6 and then walking south on Bedwell Avenue.